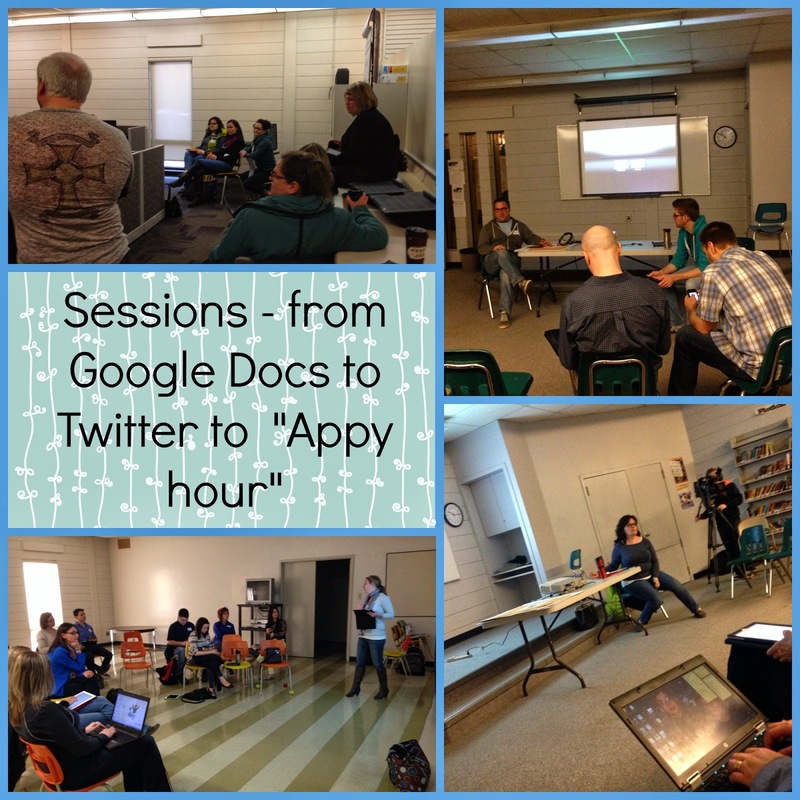 Back in August, Regina Public Schools saw the first ever EdCamp professional development opportunity. It was a new option for teachers in Regina Public at that time; the concept of professional development where the schedule was set the day of the event was disconcerting to many. The event drew a lot of educators, however, and set the stage for another EdCamp, this time on a Saturday morning. Check out the RPS Connect Ed archives to read more about the August event. 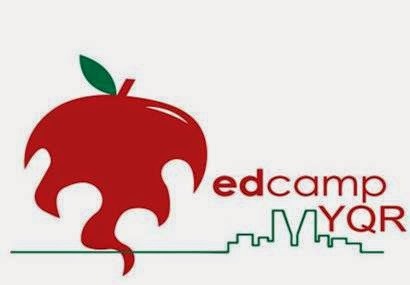 What is an edcamp, you may ask? An “EdCamp” is an unconference; meaning that it is grassroots professional development, led by teachers, for teachers. In an authentic edcamp format, no sessions are prepared ahead of time. Teachers and staff come the morning of the event with an idea in mind, something they want to learn about and something they are prepared to share. 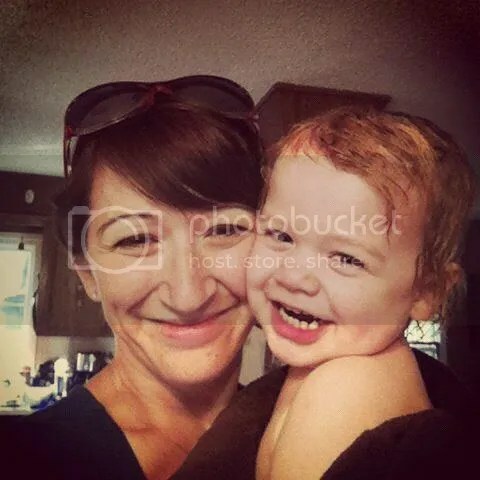 They can lead a session, a conversation, an activity, or create a planning session as needed. Additionally, they can participate in other sessions to further their own learning. The “law of two feet” applies: if you are not getting what you need out of a session, you can get up and move to a new session. Participants live tweet the event using the hashtag #edcampyqr. 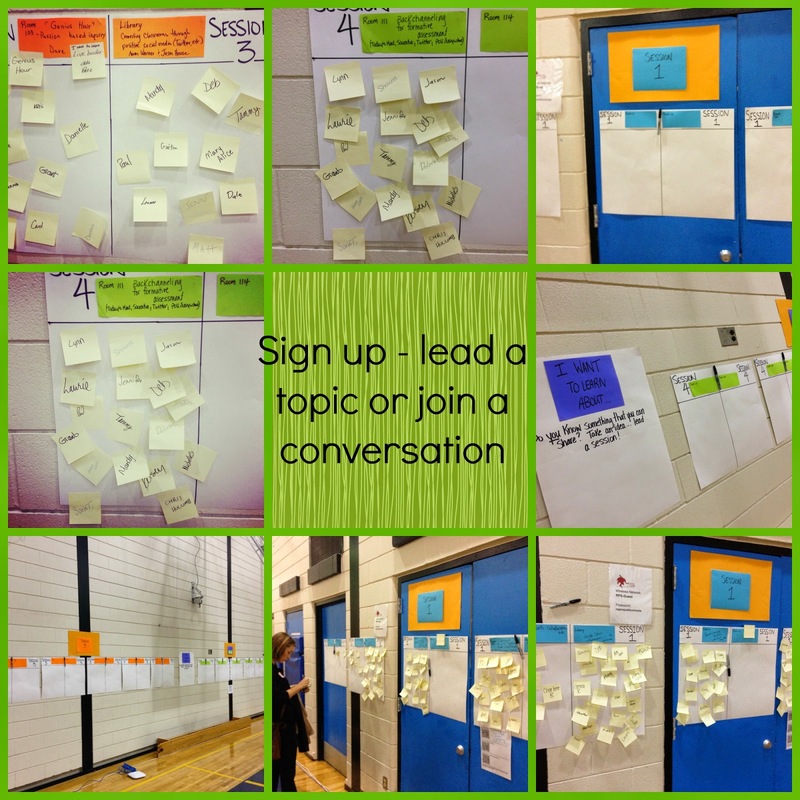 Our director, Julie McRae, also provided some insight into the EdCamp phenomenon by posting about the events to come on her blog. Participants sign up for sessions by placing their name around a subject of interest. Additionally, there are spaces for new learning (what I want to learn about). If someone wants to lead a session but is unsure, there are many jumping off points from which to start. This year’s event saw participants from multiple school divisions. Teachers and administrators from Regina Public, Regina Catholic, Prairie Valley, Horizon and Saskatoon were in attendance and the opportunity to collaborate and connect with our colleagues in other divisions was invaluable. Once the sign up was completed, the break out sessions began. From interschool novel studies, to working with Google Docs, Gr 9 math planning, Digital Citizenship sessions, Backchanneling and Assessment conversations, learning about using Social Media to engage and improve student achivement, using Inform to guide instruction, Appy Hour and Apps for primary, E-portfolio tools and much, much more, there was something for everyone. Some of the presentations followed a presentation style format, while others were conversation and discussion based. It was amazing to watch how everyone participated and shared. There were no “experts” in the audience; everyone was there to learn and discuss. 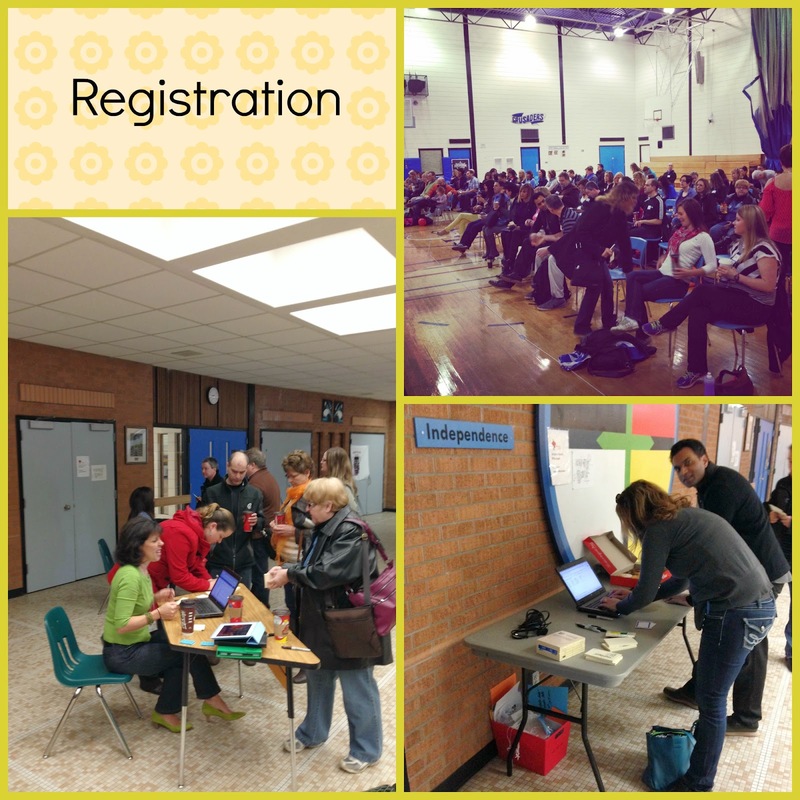 The format of this year’s EdCamp varied slightly as well given that the event was held on a Saturday. The hope was that the learning and collaboration that came out of the event would be worth educators giving up some time out of their weekend. The Saturday option allowed us to connect with other school divisions as well. It was great to be able to meet our “tweeps” in real life, much like the Tweet-Up organized earlier this year. Much of the work that we do as teachers goes beyond the walls of the schools. Professional development needs to suit the needs of the individual; for some, that may be during the school day, for others, a weekend may be a better option. Varied sorts of professional development are needed to help support busy educators in their day to day work. Check out this feedback from one of the organizers. With over 100 participants attending and approximately 30 – 35 sessions offered, we know that this model of professional development is an appealing alternative to those who desire self directed professional development. All in all, the event allowed teachers to focus on the important conversations around improving practice and learning and growing as professionals. We learn best when we learn from each other. Thank you to all who came, participated, shared, discussed. Your presence helped this be a hugely succesful event! Listen live to CTV who filmed a brief segment for the evening news (at 8:20 mark). For more information, follow the group on facebook (EdCampYQR), follow on twitter @EdCampYQR, or check out the blog http://edcampyqr.wordpress.com. All links and presentations shared will be posted on the blog.